When a member of Lisa Daehlin’s knitting group showed her the strange tendency of a lace pattern to bias, Lisa knew she was onto something good. 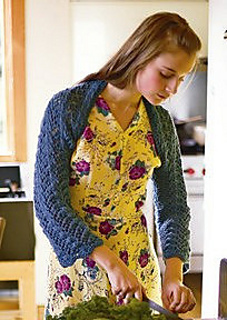 Lisa has allowed the tilt of the fabric to add flair to the floaty sleeves of this otherwise straightforward shrug. 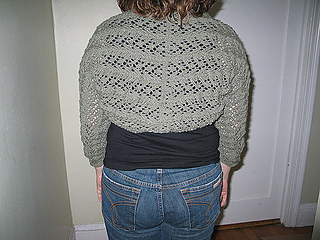 To make the sleeves symmetrical, she’s worked the shrug in two pieces, each knitted from the cuff to the center back, then grafted together.